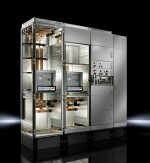 RITTAL reports the introduction of the IEC 61439 switchgear and control standards has had significant implications for the design and performance of the copper busbar system. The company says it’s an area which design engineers need to appreciate, not least because the new testing regime and the requirement for compliance has changed the way engineers think about the selection of the busbar system. Rittal says there are a number of key factors relating to the design/layout stage of an assembly, including, where to put the busbar, although ultimately the size of the enclosure will be dependent upon both the form rating and the busbar system fitted.